Cloud backup, also known as online backup or remote backup, is an alternative to conventional backup. It offers several facilities such as creating, editing, managing, and restoring the data backup. Increasing volume of data is the major factor leading to high demand for cloud backup. 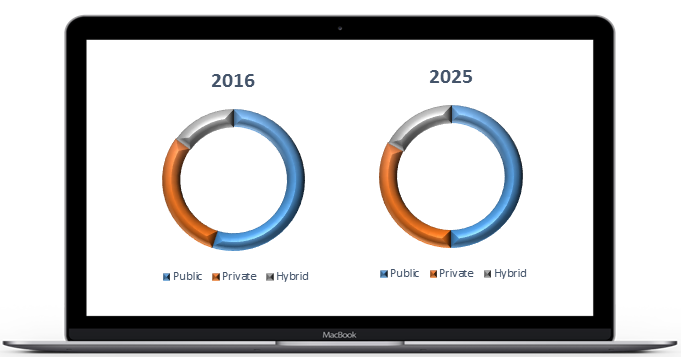 According to Coherent Market Insights’ analysis, the data sphere will reach up to 163 zettabytes, by 2025. Increasing adoption of software-as-a-service and various advantages of cloud backup such as easy installation, cost-effectiveness, performance, scalability, and flexibility have also accelerated growth of the market. Among components, solution segment held the dominant position in the market in 2016. Increasing demand for managing large volume of data and increasing adoption of cloud technology have accelerated growth of the segment. The service segment is sub-segmented into management and customization, professional services, training & consulting, and integrations. The integration service sub-segment is projected to exhibit the highest CAGR over the forecast period. Integration services helps provide cost-efficient business processes. The integrator is a pre build tools and connectors which provides services to more easily integrate cloud services such as access data on remote location access, real time data access etc. Among deployment models, the public cloud segment held the dominant position in the cloud backup market in 2016. Increasing workload on public cloud is one of the key factors for the growth of the market. According to Coherent Market Insights, in 2015, around 49% of the cloud workload was on public cloud and it is projected to reach 68% by 2020. Moreover, various advantages such as scalability, cost effectiveness, reliability, and location independency is expected to lead to increasing demand for cloud backup. The global cloud backup market is projected to value at US$ 1287 million in 2017 and is projected to reach US$ 6367 million by 2025. The market is estimated to witness a CAGR of 22.1 % over the forecast period (2017 – 2025). According to Coherent Market Insights, North America held the dominant position in the global cloud backup market in 2016. The U.S. and Canada are the major economies in North America. Shifting of workload to cloud environment is one of the major factors leading to increasing demand for the cloud backup. In 2015, North America accounted for around 42% of the cloud data center workload, globally. High presence of cloud backup market leaders in North America also fuels the growth of online backup market size in this region. Asia Pacific is projected to increase with the highest CAGR over the forecast period. India, China, and Japan are some of the key economies in this region. Increasing development in IT infrastructure by organizations especially in India and China that are adopting new technologies to work efficiently with existing systems and data. Rising trend of digitization across sectors, especially by small and medium enterprises is expected to fuel growth of market in the region. Key Companies- Global Cloud Backup Market. Some of the major companies in the global cloud backup market include Amazon Web Services, Barracuda Networks, Inc., Code42 Software, Inc., Datto, Inc., Dropbox, Inc., Druva Software, EMC Corporation, Google Inc., IBM Corporation, Microsoft Corporation, Oracle Corporation, Veeam Software, and VMware Inc. Cloud backup is an alternative to conventional backup, which is used to create, edit, manage and restore data, and application and services by using cloud computing infrastructure and resources. Global cloud back up market is estimated to be valued at US$ 1287 million by 2017. By the end of 2025, the cloud backup market is projected to reach US$ 6367 million, exhibiting a CAGR of 22.1%. Rising data volume, increasing installation of internet of things, rising adoption of software as a service are some of the key factors fueling growth of the cloud backup market. Increasing volume of data is one of the major drivers for growth of the cloud backup market. According to Coherent Market Insights, in 2016, 16.1 zettabyte of data was generated, globally. Moreover, adoption of Internet of Things is increasing the volume of data generated through connected devices. According to Coherent Market Insights, in 2016, the number of connected device was around 6.4 billion, globally. Data from these devices needs to be stored and requires huge storage space. This factor is expected to fuel demand for cloud backup. Rising adoption of Software-as-a-Service platform (SaaS), increasing digitalization, and growing use of cloud technology by small and medium enterprises is also expected to accelerate growth of the cloud backup market. It profiles leading players in the global cloud backup market based on the following parameters – regulatory landscape, company overview, financial performance, product portfolio, geographical presence, distribution strategies, key developments and strategies, and future plans. Key companies covered as a part of this study include Amazon Web Services, Barracuda Networks, Inc., Code42 Software, Inc., Datto, Inc., Dropbox, Inc., Druva Software, EMC Corporation, Google Inc., IBM Corporation, Microsoft Corporation, Oracle Corporation, Veeam Software, and VMware Inc.
Stakeholders would have ease in decision making through the various strategy matrices used in analyzing the cloud backup market. *Browse all the market data tables and figures on "Global Cloud Backup Market - Global forecast to 2025”. *Browse all the market data tables and figures on "Cloud Backup (CGM) Market - Global forecast to 2025”.